Full Moon Farm is an entirely volunteer ran organization. Learn more about them below! Purchasing my first computer in 2001 showed me a different side of wolfdogs, the overabundance of backyard breeders, rampant misrepresentation, myths and outright lies! In 2002, I agreed to help 3 other rescue organizations out with a large rescue happening in New Hampshire. and agreed to take 1 animal. Well, the truck pulled in here and I ended up with 16! 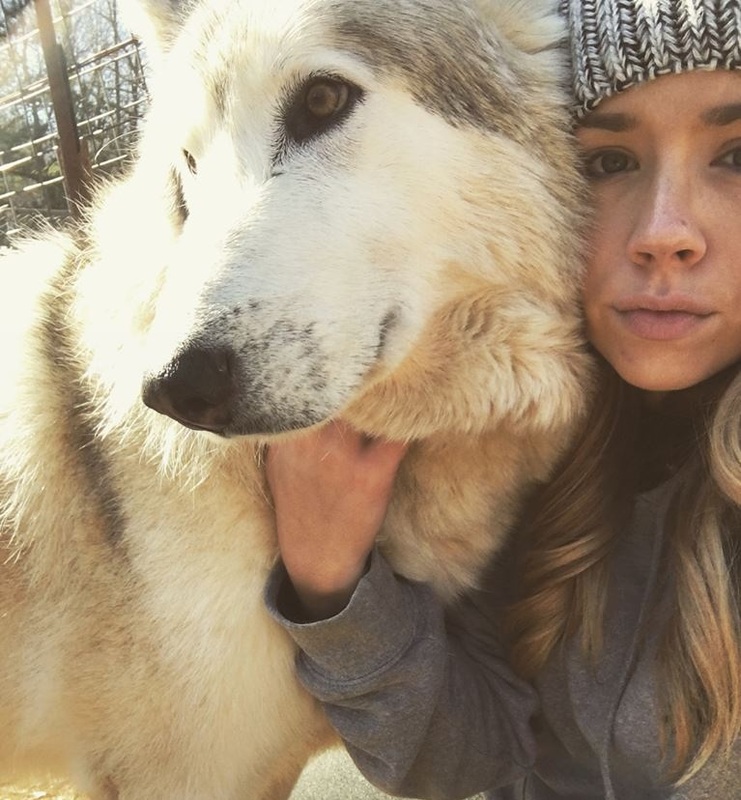 Full Moon Farm was born out of my love for the "mythunderstood" wolfdog and the need for reputable, responsible rescue! Flash forward 17 years and more than 600 "wolfdogs", (including some misrepped canines that didn't have a place to go), later, 2019 and my love of "all things wolfdog" is still strong. Aside from rescue and sanctuary, Full Moon Farm has grown into a wellspring of education for animal control organizations, other rescues and the general public. My personal animals these days are SheRa the Wonderdog, a misrepresented "Huska-Weiler" and Guido, a breeders surplus rescue. I am Fred Fulton. I am 63 years old and a volunteer at Full Moon Farm Wolfdog Rescue and Sanctuary. I have been volunteering here since July 2016 after I was invited by a friend to attend a Howl In event in June of 2016. "Howl In" event? What the heck is that? Friends replied it is an event a friend of ours holds at her farm where she rescues wolfdogs. Oh, ok I'm in. That evening, I heard the most glorious, resonating sound I have ever heard. The sound of 60+ wolfdogs howling in chorus one with another was music to my ears, being a musician. It was the single most compelling thing I had ever heard. Now, I hear it everyday and never tire of it. In the last part of March 2017 we rescued an animal that would become the best 4 footed friend of my life. He is pictured here with me. His name is Finnegan and he has become the junior ambassador for the farm. It has been my pleasure to work with him almost every day of his life. I love the farm, the animals and everything about it including Miss Nancy. If you can donate, if you can't then volunteer, if you can't volunteer then share our information. Marissa started working at the farm in May of 2018 after hearing about the dogs from another volunteer. Very much a dog person, she was enchanted by the Full Moon Farm's family of wolfdogs from her first Howl-In. She spends her time at the farm feeding, watering, cleaning up after, and building relationships with each of the animals there including the cats! 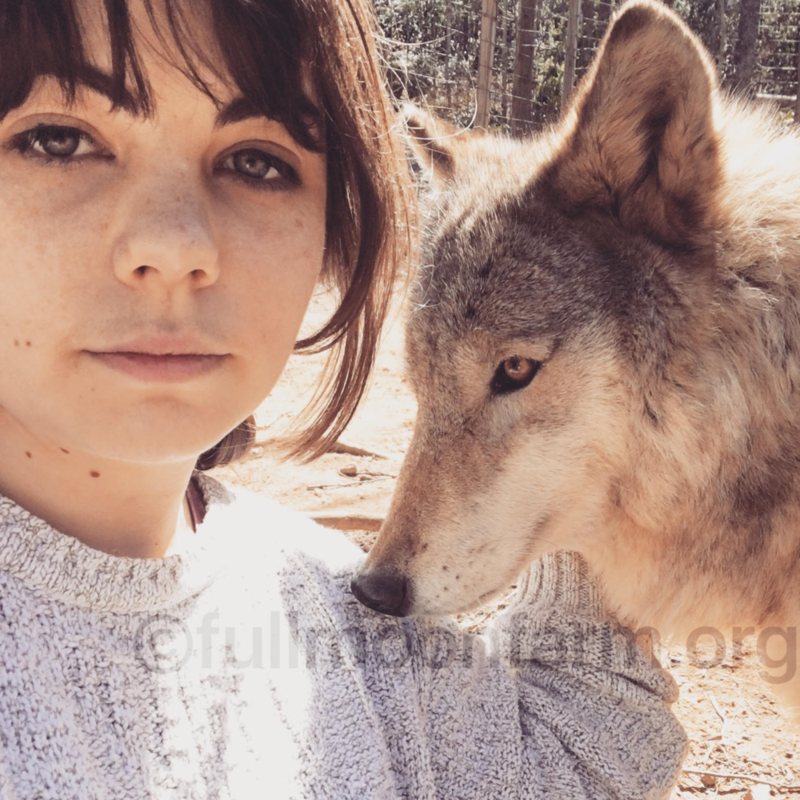 She enjoys building trust with the wolfdogs, both social and shy. Her occupation as an office manager for a nonprofit tax firm has also come in handy with volunteer work. Marissa deeply appreciates the opportunity to work with the farm to care for the unique animals who call it home. Hello, I'm Meg and I've been volunteering for the sanctuary since winter of 2004. The farm has been a huge part of my life and still is. I used to go out every weekend and did a lot of fundraisers, until I had my daughter. She loves to come out when she can with me. But now with her being older I focus the most on getting fundraisers together, and helping out when I can. I also love taking photography for the farm as well when I can. My favorite and special wolfier is Mr. Ramses. I've known him since he was 2 weeks old. He picks and chooses who he likes, and who he doesn't like. He is my sweet baby and love. I hope to be there for many more years to come. The farm has my heart and is a second home to me. I first came to Full Moon Farm when I was 12 years old. Another volunteer worked with my mom at the time and invited us to a Howl-In. I came to a couple throughout the years, and always wanted to start volunteering. In the meantime, I sponsored a wolfdog named Coal. Time passed along, and so did Coal. Eventually, I was in college. On the summer break before the start of my Junior year, Full Moon Farm popped into my head again. I worked a part time job, and wanted to do something extraordinary with my summer. I began volunteering and have remained a volunteer for nearly 5 years. When I graduated college, I knew I wanted to bring home a wolfdog. I didn’t pick her. I asked Nancy whom she thought would be the best for me. Now, I have Mesa, a permanent foster wolfdog, at my home. Her and FMF have changed my life forever and I don’t know where I would be without them. When I cannot help with chores, I can be found helping with social media outreach. I started volunteering with Full Moon Farm sometime in the summer of 2015 and quickly fell in love. Throughout my tenure as a volunteer I have had the privilege of assisting with various facets of the organization - from poop scooping to fundraising and bookkeeping. Full Moon Farm feels like my second home and I am forever grateful to Nancy Brown and the organization for allowing me to stick around. It is hard to pick a favorite wolfdog, because I love them all. The ones that have touched my soul most have crossed over the rainbow bridge, but the animals in the care of Full Moon Farm teach me something every time we interact. I listed River Girl, for teaching me to be patient and brave; and Aries, for teaching me to be present and understanding. What I enjoy most about volunteering for Full Moon Farm is the compassion our little community has for each other as well as the animals. Hi everyone, I’m Jordyn. I started with the Sanctuary as a volunteer during one of the Howl-ins. Learning the different behavior and personalities of these Wolfdogs has been an amazing adventure and I absolutely love every moment of it. These animals have all been through so much, and this Sanctuary is dedicated to giving these animals the best lives they can possibly have. I'm proud to be a part of that. Soon after moving to Western North Carolina in 2016 I decided to seek out volunteering opportunities to help me learn about the area and net new people. I discovered Full Moon Farm through a volunteer workday which was hosted on a weekend. Volunteering with the sanctuary has brought me new skills in animal handling and understanding behavior, along with relationships (both human and animal) I'm extremely thankful for. Pictured with me is Winter, a goofy mid content female wolfdog. After expelling some of her extra energy (she's got a lot) Winter does well on leash and there's a chance you may meet her out and about at the sanctuary if you visit us, as she is friendly and able to interact with respectful strangers given a proper introduction. Hey there, my name is Sarah. I started volunteering with the farm over a year ago after finding them online and submitting a volunteer form. When I arrived to the sounds of 60 wolfdogs howling at me, I fell in love and have been volunteering ever since. Pictured with me is Louie, a giant ball of fluff/couch potato and one of the sweetest boys I have ever met. After being introduced by Fred to Louie, I was quickly immersed by his lovable nature and our common obsession with food. The farm has served as a sanctuary for me and whether I am doing chores or helping with events, I love every moment of it. I have been a volunteer for Full Moon Farm since 2011. It has been the most rewarding “job” I have ever had. I have done everything from fundraising, bookkeeping, and social media to hands on animal care. Taking care of the animals (scooping, feeding, watering, grooming and socializing) is where my heart is. I have volunteered in the rain, sleet, snow, in below freezing temperatures and unbearably hot and humid temperatures. I have been covered in mud, poop, fur and everything else you can imagine and loved every minute of it. I have helped welcome hundreds of new wolfdogs to Full Moon Farm and have had to say goodbye to many; some of which I held in my arms as they took their last breath. I have loved every wolfdog that has come through the gates of Full Moon Farm, even the ones who didn’t love me back! However, since the very beginning there has always been one wolfdog who has held a very special place in my heart and that’s Shylo. Shylo came to Full Moon Farm a few months after I started volunteering. He was rescued from horrible abuse and neglect and I cried the first time I saw him. He was skin and bones and terrified of everyone. It was love at first sight for me and I made a promise to him that I was going teach him what love was; and that’s exactly what I did. It took lots of patience but I finally earned his trust and his love and we have been best buds ever since. When I first arrived at Full Moon Farm, in April 2015, a chorus of howls greeted me as I parked my car. I couldn't believe my luck. I thought every animal was essentially wagging it's tail, happy to have a visitor. Little did I know then, that to become part of this wolfdog family is to be gazed upon with open-hearted silence. Now, when I arrive for my weekly chores, I park and get out of my car to nothing but the wind. That is, until our eyes meet, and their mouths open wide into sunning-alligator-smiles waiting for treats and proper hellos. Before I start the daily chores, I circle the entire farm to greet every animal. But one in particular, stops me longer than all the rest and forever steals my heart. Born in 2010, Kahlua came to the farm in October 2016, after his family could no longer keep him due to a life demanding travel. But, Kahlua is very social and thrives in the farm environment where he enjoys the extra canine company, and lots of love and snuggles from the volunteers who care for him. He is NOT a lone wolf(dog). Although Kahlua is a high-content wolfdog, with 85% or more wolf genes, he displays many behaviors typical of your house-dogs as well, including obsessively kissing faces and enthusiastically wagging his tail. Like most wolfdogs, Kahlua decided at some point during the first two years of maturity that he enjoys outdoor accommodations more than the confines of being indoors. This should be anticipated from wolfdogs and is why we have strict fencing requirements for animals that are approved for foster homes. Kahlua's favorite food is chicken. He also loves to have a high vantage point from the rooftop of his doghouse, and every time you look over, you can usually spot him staring longingly at you, awaiting your return. I really do love them all, but Kahlua and I have a deeper relationship and he forever has a spot in my heart (and hands).